CHANGES features Tim Curran, Tita Tavares, CT Taylor, Tom Curren, Bryan Jennings, John Carper, Skip Frye and Chris O'Rourke sharing their unique stories of how they came to believe in Jesus. 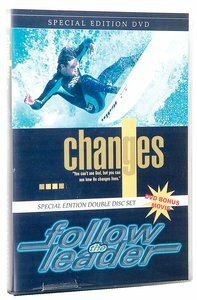 Released in 1998, CHANGES combines exciting surfing footage with dramatic interviews. It features music by Switchfoot, Jennifer Knapp, the Supertones and more. Includes Japanese, Russian and Spanish subtitles. 2 disc DVD. Released in 1996, FOLLOW THE LEADER features Tom Curren, CT Taylor, Sean Hayes, Joe Curren, Bryan Jennings and others surfing in remote locations including Samoa, Tahiti, Tavarua and Olvidados in the Eastern Atlantic. It also includes footage from Mexico, Hawaii and California in the wake of the El Nino winter. Soundtrack features music by MxPx, Dogwood, Tom Curren, Value Pac, Model Engine and more.